Today let’s make it tutorial time. 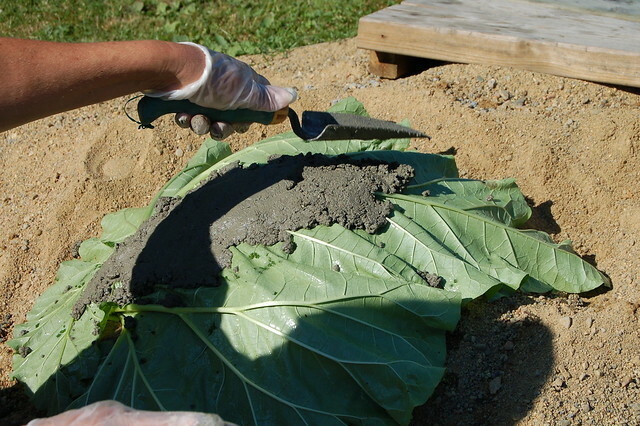 I took a series of photos to show you how to make your own bird bath with concrete using a big rhubarb leaf (this is rabarber, in English rhubarb) as the mold for casting the concrete. 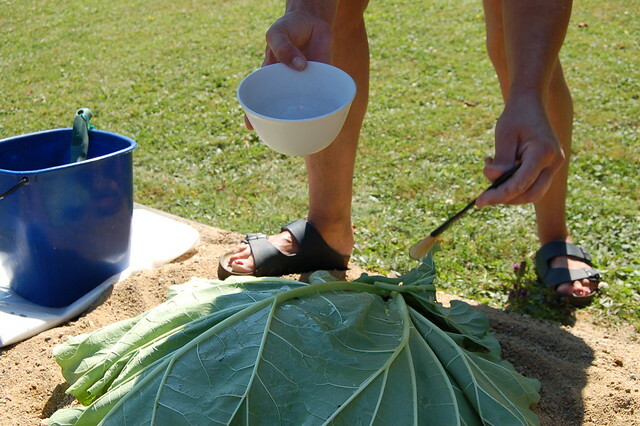 A Rhubarb Leaf Bird Bath, no less. My mom is very creative, as many of you know. I thought I’d post some action shots of my mom being creative in her beloved garden in July. She created a Concrete Bird Bath from a Rhubarb mold, and here’s how she did it. 1. Form the rhubarb leaf as a bowl. Mom did this in the kid’s sandbox, for just a slight curve of the bowl. 2. Spread cooking oil on the Rhubarb leaf, so it won’t stick too much when you start to apply the concrete to the Rhubarb mold. 3. Mix the concrete, according to the instructions on the package. …you will need lots of concrete if it’s a big leaf. Let this dry in the sun a couple of days under a tarpaulin (that is a new word for me, means presenning in Swedish). 5. Once it’s dry remove the tarpaulin, leaf and take it out in all it’s glory. Now you can use it outdoors for many years to come. You could plant in it and use it as a flower bed in a corner of your garden, or fill it with water and let the birdies have a nice bath. Thanks to Tine Sparkles of Studio Friday for the prompt to share our roots. Dad made the pond a couple of years ago. It is so very beautiful. I guess I got my creative roots from both sides of the family. ** Before you go, also visit and follow my boards on Pinterest – I share loads of colorful art, craft and creativity there, including greenery and plant inspiration. This entry was posted in Tutorials and tagged garden, gold fishes, greenery, how-to, momcraft, studio friday. Bookmark the permalink. Wow! That’s so cool and so is your Mom! Det blev ju superläckert! Jag fattade inte att ni hållt på sådär. That is such a cool bird bath. I could see the kiddos getting involved in a project like this. As for me, my creative roots come from both sides of the family tree. thanks for sharing the photos,tutorial and your roots! What a creative mom, that is such a good idea. I recently started experimenting making little mosaic things with concrete and it really is a versatile and cheap material. The bird bath is so inspiring – thanks to your mom for the idea and you for the tutorial! Wowzers. That is one aweseom bird bath! And a great idea! Thanks for sharing. Neat your creative roots and a tutorial at the same time!! Jåss – så kreative – og dyktige – dere er !!! Such a cool idea! Way to go Mom and Dad and Hanna! fabulous idea, it turned out great! These would look great as stepping stones too, if you made them flat! What a creative family! Love the birdbath. Very cool. (Pretty backyard, too!). Very Cool! What a creative mom and daughter team. how wonderful to see the creative process in “action”…how wicked cool of your mom & you! OH, what a great idea and so much fun! Thanks so much for sharing the pictures in action! You can defintely see were your creative roots come from! 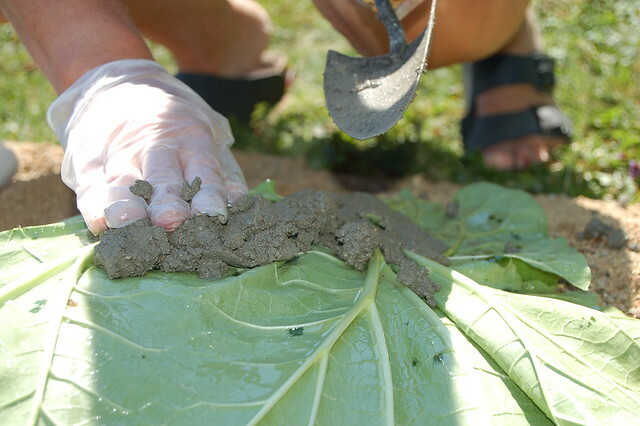 I have the rubarb leaf and the dry cement ready. My husband is playing Playstation so I am off to find a son to help me. This is a great idea, thanks for sharing! I will be sure to post a pic when we finish! Flotte bilder! det ser ut til at b?de moren og faren din er kreative mennesker. Jeg tror nok at jeg ogs? har f?tt mine kreative evner fra begge sider av familien, men antakelig mest fra morsiden. Morfaren min var fantastisk b?de til ? male, bygge ting, snekre, osv. Vilket vackert f?gelbad! Och, det ser inte helt om?jligt ut att g?ra. Look at you and your mother doing such wonderful things! 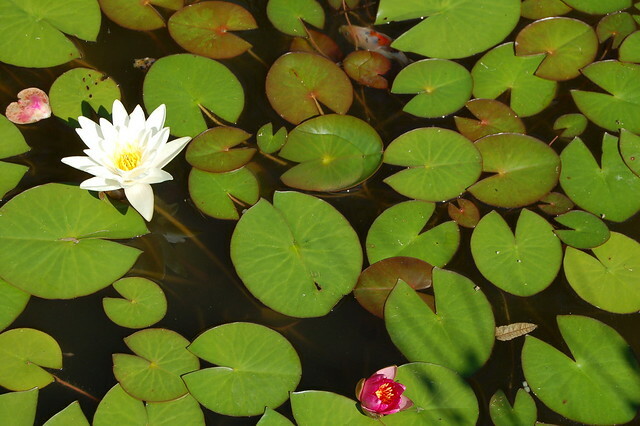 I love the water lillies in the pond. Jättefina bilder, kul att de har gett så mycket inspiration till andra. Vi är ett bra team Hanna. Jag är inte trött på allt pysslande med dig, du får snart komma tillbaka, det är så roligt när du är här. Very Nice! 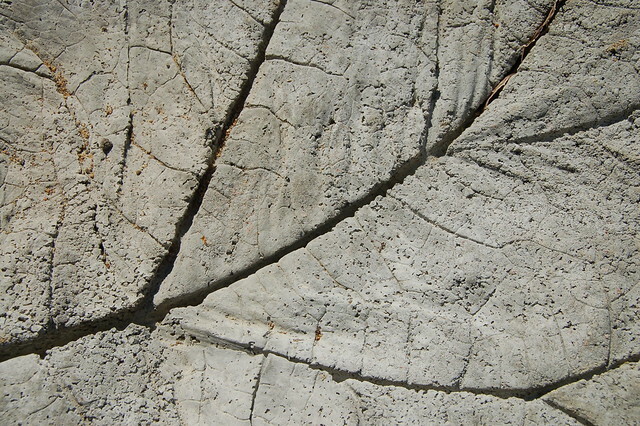 If you like playing with concrete & such, you might enjoy my new website. Marvelous – made three so far and am in th process of doing a base for one of them. Have you ever made a frog pond? If so anything you could share as to how to go about it would be so appreciated. Excellent idea. I will have to try that once I have my garden planted. I think I would put another leaf on the outside, so the bottom has the same texture. That looks wonderful. 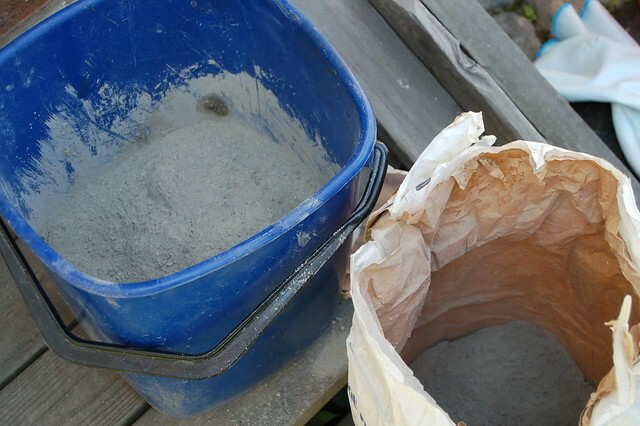 What is the recipe for the cement mix. I tried to make one once and the cement broke around the edges. I love this idea, I’m going to show it to my hubby. He’s already made a ‘dry’ pond with slate chips and lily pads he made from sheet metal. That is too cool! I love this kind of idea. I’d love to make one for my garden. Thanks so much for the great idea and encouragment! My first attempt came out GREAT!!! My family was so impressed. I had no idea that Quikcrete came in so many varities. The one I picked was chunkier than I would have liked but still came out great. The concrete dye looks really nice but it’s a lot thicker than I imagined. I would have stirred it in with the water a lot better at first and in a bigger container. It got very messy. Gloves are a must for my next one. It really really dries out your skin. I even put on moisturerizer before and after, and it still dried my hands to the point of peeling on my palms the next day. Any helpful hints on how to clean up the rough edges? Hammer, dremmel, leave it? I want my parrot to be able to enjoy it but I don’t want him to cut his feet. Thanks so much for the great idea. Now my options are only limited be my imagination. I forgot to mention that I used cooking oil spray to spray the leaf and it worked great. My leaf turned out more shallow than I wanted it because of my patting the cement to make it firm and eliminate air pockets. Keep that in mind when you make your mound, that it will flatten a little with all of your patting and shaping. Hi, I am wondering… Is the lime in the concrete bads for the birds? 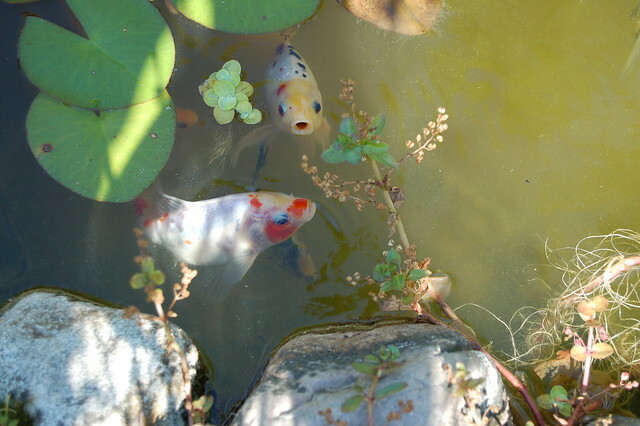 A few years ago I made a concrete pond and in doing the research I found out that the lime in the concrete is toxic to the fish. I want to make one of these bird baths but anyone know if it is toxic to the birds and if so, can I paint it, or is paint toxic? My birdbath had a white film whenever the water evaporated, and my husband said it was the lime leaching out of the concrete. I bought a concrete sealer which should stop the leaching. You can also use polyurethene, but the concrete sealer leaves a more natural look. I just put it on today, so I’ll let y’all know how it works when I fill it again. I made one of these leaves this winter while in Florida…I made it with a huge elephant ear leaf. I used quik-crete, but the one without stones. My leaf came out great. Definitely seal it or paint it with non-toxic paint. I plant to make more with different leaves and try the garden stone…LOVE IT! 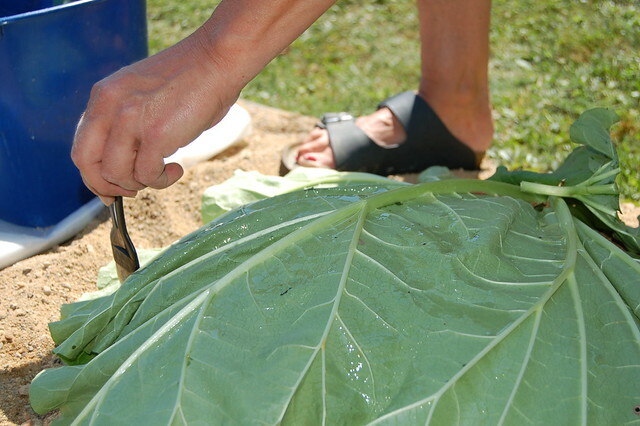 I have used the rhubarb leaf, makes a nice bird bath or stepping stone. 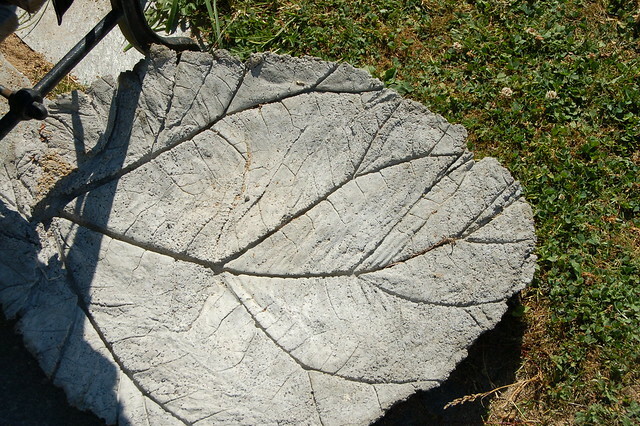 Try using a large hosta leaf, this leaves a nice pattern in your bird bath.